Ultra-faint dwarf galaxies are the smallest, most dark matter dominated, and least chemically enriched stellar systems in the universe, and are important targets for understanding dark matter and galaxy formation. They comprise by number the majority of galaxies in the universe, and not least, dwarf galaxies around the Milky Way provide crucial empirical input for verifying formation scenarios of our own galaxy. There are currently about sixty dwarf galaxies associated with the Milky Way and closer than about one million light-years; the Andromeda Galaxy, our closest large neighbor spiral galaxy, is two and one-half million light-years away. Many new MW satellite galaxies have been discovered in the last few years, but some have been called into question by more sensitive imaging campaigns and most have only poorly constrained properties. 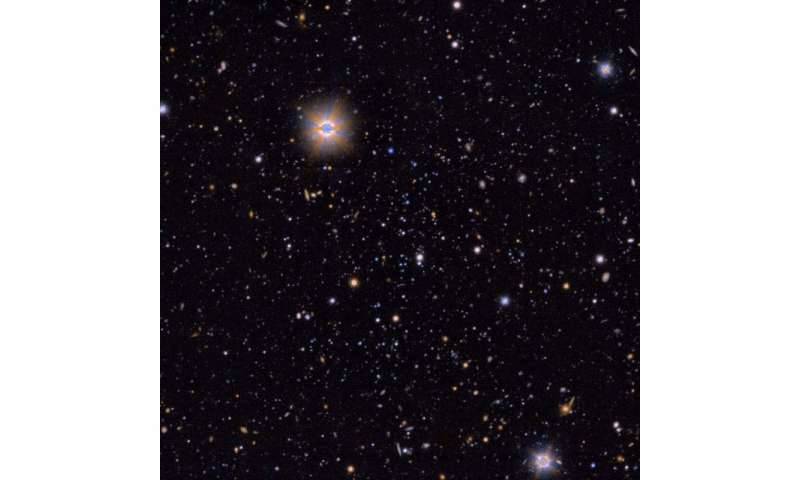 CfA astronomer Nelson Caldwell was a member of a team that used the Magellan Clay telescope and the Megacam instrument to obtain images of four nearby dwarf galaxies probing nearly sixteen times fainter than previous measurements. The images reveal new stars and other objects, including extended structures, and enabled the astronomers to revise key parameters of these galaxies. One of the dwarfs, Sagittarius II, with a gas mass of only 1300 solar-masses, is unusual in that it is small in size even for a dwarf galaxy and might instead be considered as the most extended globular cluster of stars for its brightness. Another, Reticulum II, is the most elongated dwarf galaxy known (nearly eight times longer than it is wide). A third, Tucana III, seems to be associated with a stream of material flowing into the MW and may be tidally disrupted. The sensitive new results were unable to measure any gas in any of the objects, but they set new limits, and will help astronomers make a more complete census of the Milky Way's family of galaxies. "The sensitive new results were unable to measure any gas in any of the objects." "Ultra-faint dwarf galaxies are the smallest, most dark matter dominated, and least chemically enriched stellar systems." These Pop-Cosmologists can't tell us what the "gas content" of these dwarfy little star clusters are, but they sure make it a point of informing us they discovered lots of cosmic fairy dust without telling us how they did it. If they can't even measure the "gas content", they sure as hell will never be able to measure something as ghosty as their precious cosmic fairy dust. These two commenting is as amusing as visiting the zoo. And watching (from a safe distance) the monkeys in separate cages. Loudly screeching while flinging their poo at one anther! Benni's right, rrwillsgizbag is a moron. Being skeptical of dark matter is not what monkeys do, poops on you.